It's 6:21 PM on Saturday, July 26, 2008 here in Key West Florida where the average year round temperature is 77 degrees! Here's the forecast for the next few days! Be our guests at the Curry Mansion Inn, the moment you step inside, you begin to feel the unique ambiance of the Curry Mansion Inn. The Inn was voted - #64 on Conde Nast's list of the 100 best hotels in the US in 2006, as well as one of the nation's top ten Bed and Breakfasts by INNovations' National Network Services. Nestled alongside the original 1899 Curry Mansion, the Inn offers 28 elegant, romantic rooms. Most open onto a sparkling pool and are surrounded by the lush foliage of the Curry Estate. Like the Mansion, rooms are beautifully appointed in wicker and antiques and offer private baths and phones, wet bars, air conditioning, ceiling fans and cable television. Other amenities include parking, a hot tub and swimming pool that are open 24-hours a day. Guests enjoy the finest amenities, including a full deluxe breakfast, daily open bar cocktail parties and full access to the 22-room mansion built by Florida's first millionaire family. Our Inn is barrier free. The Inn is equipped for corporate parties, conferences and receptions. Our staff can help you plan any special activities, dining, sports or fishing arrangements. Guests are encouraged to call prior to arrival to make these arrangements. The temptations of Key West are just steps away. History of a Grand Manor... And the Key Lime Pie - it really was first created in the mansion's kitchen at the turn of the century by the Curry's cook, Aunt Sally! One evening in 1975, Al Amsterdam docked his yacht in Key West's harbor and took a stroll with his wife, Edith, through downtown. Al and Edith, the owners of Casa Blanca on Cherry Island in upstate New York's Alexandria Bay, were especially fond of historic homes. Edith spied a wedding-cake white mansion aglow with the light of it's crystal chandeliers. A for-sale sign hung in the yard. Fortunately for Key West visitors, the Amsterdams promptly bought what was to become the Curry Mansion Inn. The mansion was (and is) their family home ever since. The house was named for William Curry, a penniless Bahamian immigrant who made his fortune reputedly as a salvager -those scurrilous fellows who preyed on shipwrecked travelers in Florida's pirate-infested waters.- Curry attained status as Key West's first millionaire and began building the Mansion in 1855. The architectural details are common to wreckers, incorporating elements of many ports-of-call: the widow's walk of New England, the ornate trellises and balustrades of New Orleans and the columns and colonnades of the Deep South. Curry's son Milton completed the Mansion in 1899, furnishing it with the 18th-century antiques and Victorian pieces gracing the parlor today. The imposing entry is paneled in bird's-eye maple, handwrought spindles and Tiffany glass sliding doors. A formal dining room is staged with Haviland china and faux replicas of the Curry family's original solid-gold Tiffany flatware. An 1853 Chickering piano, reputedly most recently of Henry James's Newport home, sits in the music room. Today the home of innkeeper, Edith Amsterdam, the Mansion is also an intriguing museum listed on the National Register of Historic Places. 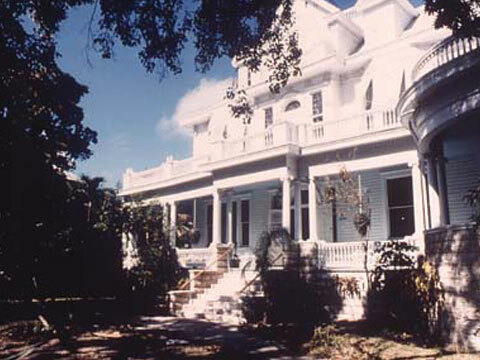 The Curry Mansion Inn...where the elegance of Key West's past is equaled only by the elegance of it's present.